I made a mistake. I guess I thought I was choosing an easy option which in my book is always the best play. Any fool can be uncomfortable, save your energy to fight the battles that need fighting, don’t be a martyr and put yourself in the fight. By deciding to cycle the route of the Camino de Santiago I guess I thought it would be a way-marked route like the Eurovelo 6 route I followed earlier in the trip. Yes it is a (very well) way-marked route, in fact you don’t need the sign posts, you just follow the hordes of walkers or pilgrims as they like to be known. I didn’t follow the walking path, you seriously need a mountain bike with little luggage and an iron will to cycle that. I followed the road route instead, what with my lack of a mountain bike and my addition of 6 bags on the bike. 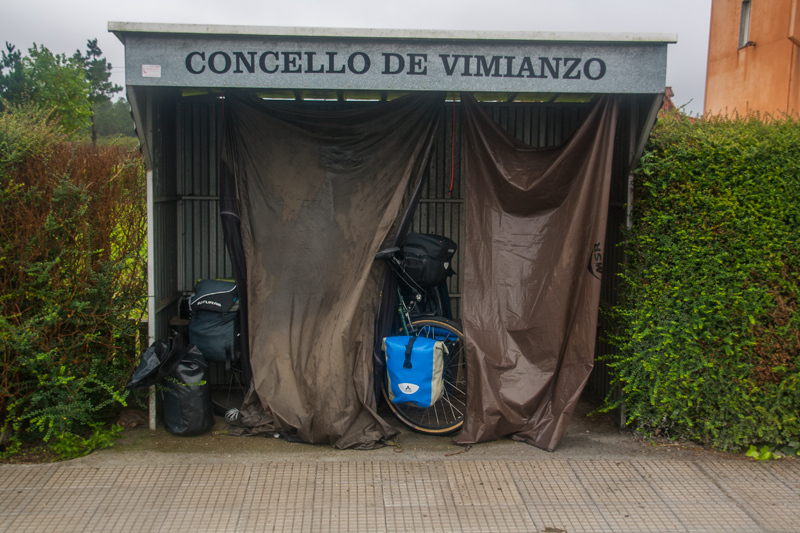 Some of it was great cycling, some of it was boring, some of it was extremely hard work, some of it on busy main roads with trucks hurtling past, some on quiet country roads with walkers all over the road….the same as a lot of my route towards Spain. The problem came (and this is my problem, I know) with the sheer number of tourists, sorry I mean pilgrims that walk the route. 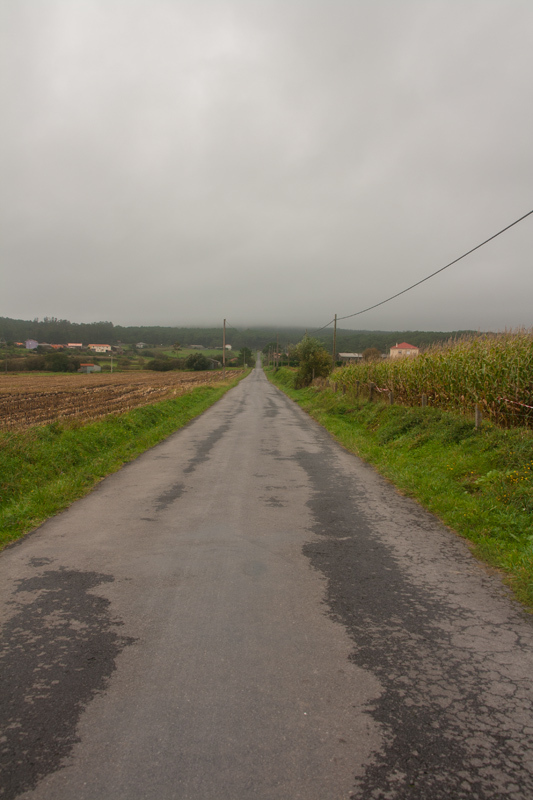 Therefore you are just another one, by appearing in a town or on a road near the route, you must be cycling the Camino. Assumptions made without discussion, you are just a wallet to the locals and a fellow pilgrim to the tourists…..Everyone forgets how to say hello and merely greets you with the name of an elusive character called Ben Camino. It frustrated the hell out of me to start with, then I just resented it, at one point I found it amusing as I would watch the face and listen to the tone of their voice as they greeted you by the elusive name of Ben. My favourite were the blokes (and it was always a man) who would put on a face that says, ‘I’ve been walking a LOT and I’m tired, but I’m hard so I will keep going’ and grunt out Ben’s name. Seriously mate. The upshot of this was that it was a rubbish place to learn any Spanish as it’s so geared towards tourism that all the people in the shops would speak English at you and the people I met on the road were inevitably tourists. I need to be forced into doing something difficult like learning a language otherwise I’ll take the easy option. The obvious point, why not change my route as I went?, like I had done in France. Well it turns out Spain doesn’t have anything like the road system of France or the UK. There often was no other option other than to continue heading west on the same route, so I decided just to stick at it and keep going. I managed to camp the whole way apart from three nights, but it got wetter and colder the further I went and I got bolder with my camping spots! To reclaim (in my mind) the journey across Spain as my own rather than just another tourist, I found on a map that Cabo Tourinan was the most westerly point of mainland Spain. A valid reason for a visit, as valid as going to Basel in Switzerland. The section from Santiago to Cabo Tourinan was the best and worst of times. I got the road back, once I cleared 25km from Santiago it was no longer on the walking route. As I got closer to the coast it was on to back roads and small villages. 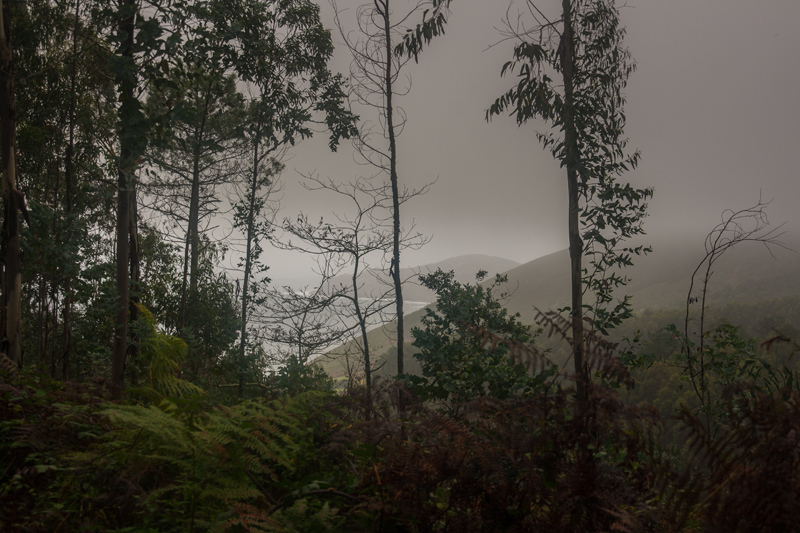 That moment when I crested a rise and saw the Atlantic Ocean, I slammed on my brakes and slid to a halt at the side of the road with a smile plastered across my face whilst I grabbed the camera (photo at top of this page). Free wheeling down the hill into the village of Tourinan, a town the world forgot, besieged by the weather, a small collection of buildings huddled together around a few narrow streets, I filled up my bottles from an old lady’s tap. I then headed for the spit of land jutting out into the Ocean which is the Cabo (Cape) and where a lighthouse would mark the end of the road. 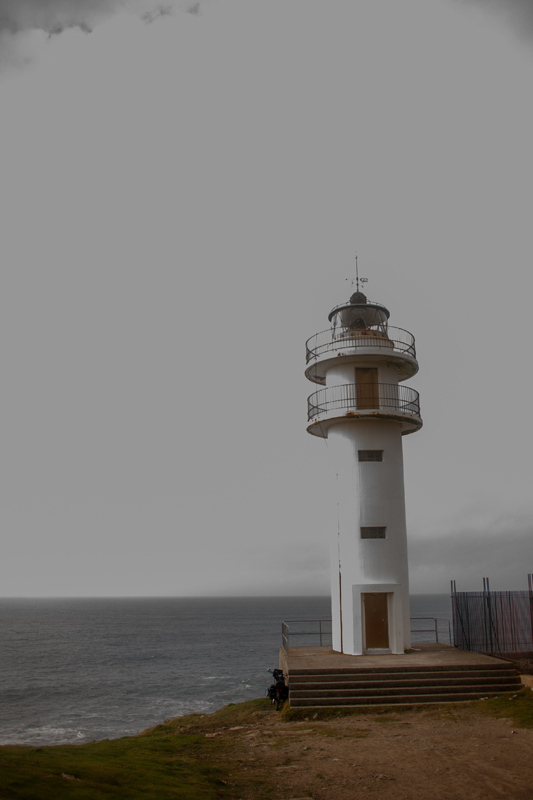 It was another couple of kilometres out amongst nothing but sparse bush to the lighthouse. There was no more whooping, just a quiet satisfaction that the road hadn’t beaten me. My dogged perseverance was enough to get me there, I hadn’t won, I had merely been allowed to continue to my chosen spot. The worst of times had been the weather getting there. It had rained for 3 days and the wind had been up, only letting up occasionally. The previous night to arriving at the Cabo I had poorly pitched the tent due to lack of space, tiredness and general lack of any other option. The wind that night taught me a lesson. After being up three times in the night (in the rain) sticking my fingers into a bramble bush to try and peg the door down again I need to make sure I do it properly in the first place. During the days the rain had been up in the ridiculous scale, far beyond comfortable cycling weather. I duly questioned what the hell I was doing out in this weather, cycling, just to get to an arbitrary point on a map. However I couldn’t bail out even if I wanted to, where else was I going to go? It wasn’t like I could turn around and go back home. My home was strapped to the rear rack and it was wet. So I kept going, with the mantra running through my head, that the weather never stays the same for ever, it doesn’t last, it always will change. Mentally I was down low; shouting at the wind and rain to give me a break as I trudged up yet another hill in my lowest gear with the wind buffeting the bike around and everything I was wearing was wet. It cost me something to cycle to that lighthouse, I sold some of my reserves of enthusiasm, hopefully I got more resilience back in return so next time I will be stronger. As for that lighthouse. I had arrived around 5pm, at the most westerly point of Spain, I cooked my dinner in the shelter of a boarded up building adjacent to it and considered my options on where to camp that night. 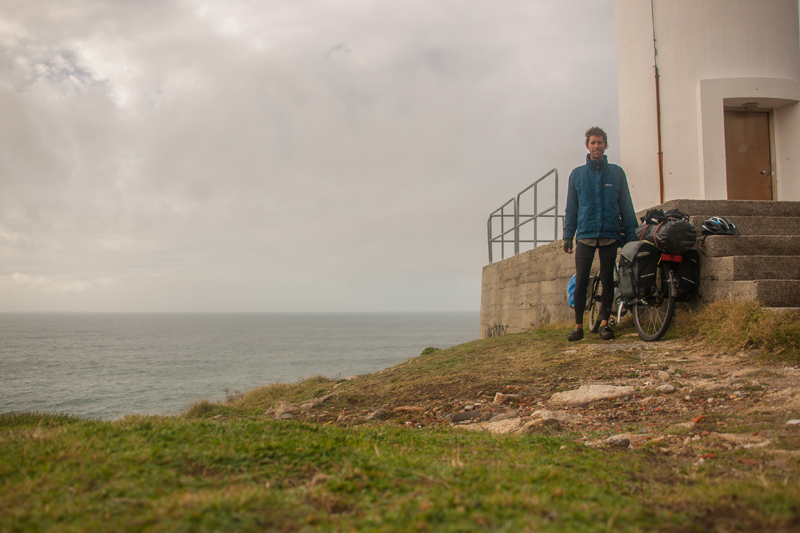 I had kept my eyes open on the way in for anywhere suitable but once I was at the lighthouse, the opportunity to camp on that desolate spot of land sticking out into the Atlantic Ocean was too much. There was no one around at all, the ground was good and the undulations provided ample cover. The problem was always going to be the wind. I found a spot a few hundred meters from the lighthouse which ticked all the boxes apart from if the wind got up in the night it would funnel down past me. I had some cover from the vegetation and in one of those inevitable decisions which you come to regret, I thought sod it, it’ll be ok….. I made sure to pitch the tent as well as possible, getting the stakes in hard and at a tight angle ensuring the flysheet was taught. Somebody was looking down on me as the rain had stopped and I got to sit and watch the last remnants of daylight vanish over the western horizon, letting my thoughts run and the tension evaporate. I was rudely awoken during the night by the storm that came through. The wind was gusting like I’ve not experienced inside a tent before and the rain was incessant. I lay there for some time watching the flysheet balloon and flap from the strength of the wind, sounding like a machine gun firing next to your ear. Hoping upon hope that my diligence in getting the stakes in firmly was going to be enough. I had time to think. ‘I’ve messed this up’. People are going to read about me on the news. I had visions of the wind picking the tent up with me inside it and blowing us down the hill and off the cliff face into the raging ocean. At that point I put the remaining panniers inside the tent for more ballast and managed to calm myself enough that there was literally nothing left I could do to help the situation. I fell asleep, when I woke, everything was still intact and the storm had passed although it was still raining and a tad windy. An experience that will definitely help me remember that day when i reached the west coast of Spain! I was due to have a day off, one I very much needed, but there was nowhere to stay (clearly I couldn’t remain where I was!) and it was raining and the wind got up again. One thing led to another and I had another day from hell in the monsoon conditions, begging the weather to give me a break,’ you can rain, just don’t pour down like a power shower constantly’. I kept reminding myself of the futility of asking the weather for favours and knowing that it crushes you a bit more when it then gets worse. So I rode back the way I came, curiously it was all uphill again, as it had been on the way to the coast and of course the wind had turned so it was in my face again. 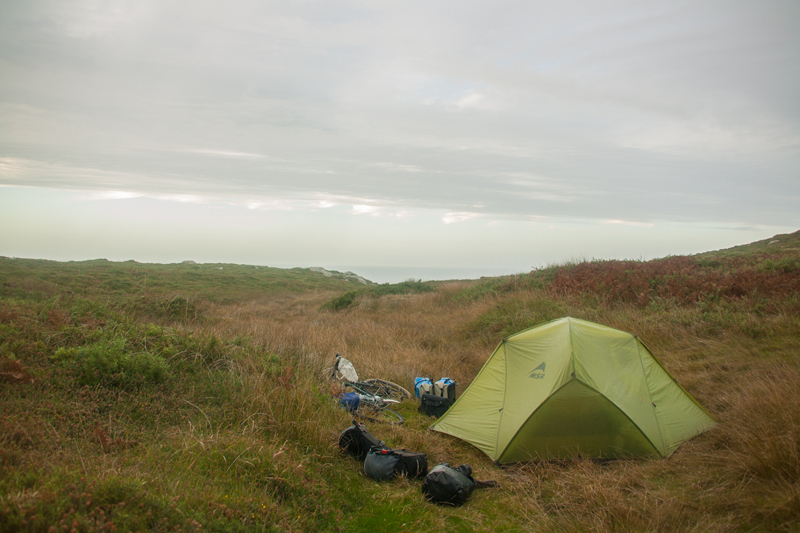 I struggled on, deciding to bail and get a hotel as the tent was wet and I was at a low ebb. The hotel never came, there just wasn’t one. My mind played tricks on me, I could picture one I had passed on the way to the coast but when I arrived at that town it wasn’t there. My spirits plummeted, it was all I had to arrive there and now I had to keep going, I was empty and I don’t know what was powering my legs, but they had to keep turning, so they did. I thought again, ‘you are in this predicament because of a nonsensical desire to go to the most westerly point in Spain, just because’, which just beat myself up further. As I was now merely returning to where I had started, the futility of it all was compounded. In the end I arrived in a big town that I knew there were lots of places, just before dark and got a bed. Exhausted, empty and very wet. The only thing worse was knowing I would be getting up in the morning to put my wet shoes on again for the 5th day running and cycle up some more hills. The only saving grace was that it was only 20km left to go before I could rest properly. It took me two hours. I’m not sure who was on the bike that morning, my body was, but my soul had long departed. I trudged along like a zombie, willing for it to be over, and when it was, I felt nothing. Time will (and has started to already) fuzz over the despair parts and remember the good parts, the sense of achievement, the dogged perseverance, my mind will shape the journey as a whole rather than just remember the end. For this is the end of my European travels, it ended at that lighthouse at Cabo Tourinan, the rest of the cycling is just commuting. The ride from the UK to Spain was the warm-up. 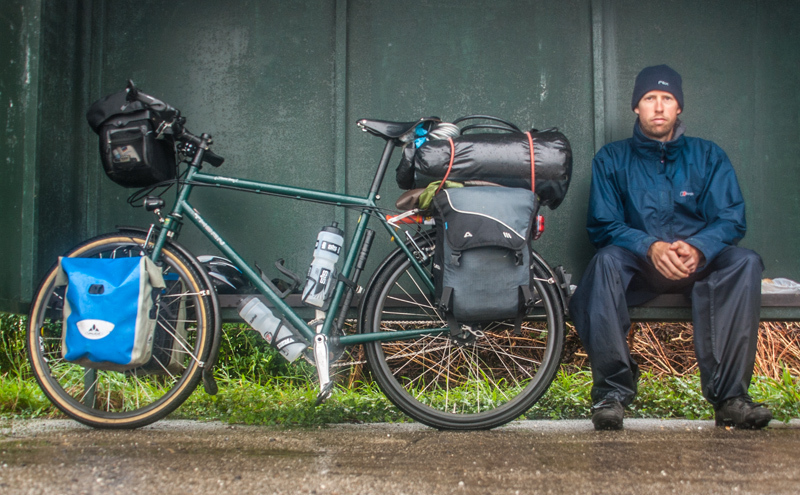 A 3 month warm-up for the next leg, cycling from Argentina to Alaska, an 18 month trip. First I am moving to Buenos Aires (in a week’s time!) for a month to attend a language school to learn as much Spanish as possible. Then I fly down to Ushuaia at the very bottom of Argentina in Terra del Fuego and head north with the intention of aiming for Prudhoe Bay in Alaska. I’ll be leaving at the beginning of December 2014. I’ll never make it, I’ll give up, the weather will defeat me, it is impossible for me. But maybe, just maybe I might make it. To be honest the dream will be complete upon the first peddle stroke leaving Ushuaia. To even make it to that point and begin the trip was a completely impossible notion for me, it was something other people did. Now it is more than possible, it’s happening, I made it happen and that is a huge achievement for me. Great post, great pics mate – keep going! Enjoyed your post and reflections on the difficulty of your journey. I have just cycled across Spain myself, North to South, through that same terrible weather often asking myself why am I doing this! I am in Córdoba now where the weather is a heatwave and heading off to almeria via Granada. not been keep a blog though. Glad you are still in one piece, your Argentian journey – and beyond – will be epic. Good luck with it all, and enjoy learning the language. I have been learning Spanish intensively for 2 years now and has made all the difference to this trip in terms of the interactions with people. You will get a really good start with one monthin BA for sure. Congratulations on digging in and getting the European leg done, both mentally and physically. Thanks Lucy, glad you enjoyed it. That’s pretty awesome that you windsurfed round there as it’s a wild coastline! Man up! 😉 Buen viaje! haha! I’ll take that from you!